Poor indoor air quality can aggravate asthma and allergies, trap unpleasant odors in your home, and contribute to the development of lung conditions. Use these tips to give your space a quick refresh without worrying about dealing with the HVAC unit. Particles of dirt and other debris get trapped between the fibers of cushions, curtains, and furnishings. Keep living spaces clean to reduce the amount of irritants in your indoor air. Hire a professional cleaner to treat your carpets, drapes, and furniture. High-powered steam kills bacteria and removes ground-in dust that can become airborne every time you sit or walk. Bring houseplants into your space. These floral accessories remove toxins from your air while beautifying the room. Invest in an indoor air purifier to keep airborne particles to a minimum. With a wet-dry vac, clean hardwood and linoleum floors thoroughly to remove thick layers of dust and mold. Give special attention to baseboards and carpeting that lies against the wall. A periodic deep cleaning keeps mold spores from taking root and ruining your indoor air quality. It also removes known allergens that can compromise your respiratory health. The best way to keep your indoor air quality high is to reduce the number of particles you let into your home. Aerosol sprays, such as deodorants, leave behind heavy chemicals that complicate breathing and irritate sensitive skin. Skip the spray versions of your favorite cosmetics, or use them near an open window to keep potentially harmful ingredients from sticking around. Reseal windows and door frames to ensure an airtight fit that keeps unwanted drafts from introducing foreign particles into your space. Repair any water leaks in your basement, bathrooms, and kitchen area to discourage the growth of mold and mildew. 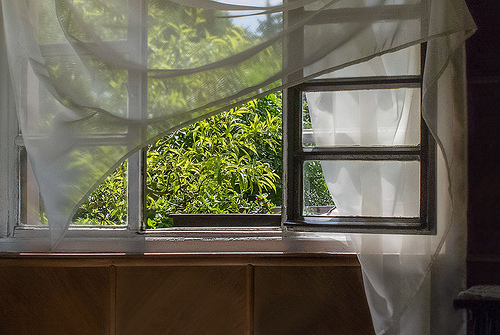 Open windows and doors to improve indoor air circulation and sweep irritants out. Use a box fan to clear small or enclosed spaces quickly. Defend your space from heavy particles to protect indoor air quality. Do you need more ways to improve your indoor air quality without getting your HVAC system serviced? These tips will help you fine-tune your clean air routine. Vermin such as cockroaches, mice, and ants can threaten your indoor air quality. Call an exterminator to clear them out. Keep the use of perfumed sprays, incense, fabric refreshers, and other home fragrances to a minimum. Pets are sources of irritating dander that sticks to everything it touches. Bathe and groom your pet regularly, especially those that spend time outdoors. To reduce indoor exposure to harsh chemicals, make your own eco-friendly household cleaning products. Radon and carbon monoxide are odorless, colorless, and potentially deadly. Install an air quality monitor that alerts you when levels get too high. Your HVAC system is an important component in your home’s air quality. However, there are many steps you can take to improve your indoor air without the hassle or expense of HVAC service and repair.